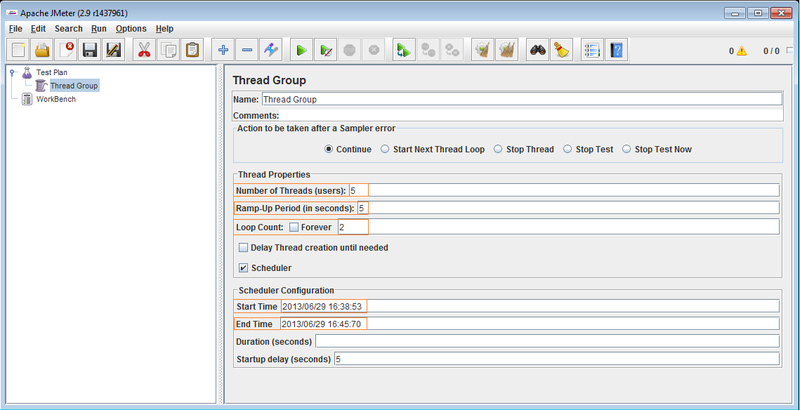 Thread group is very important element in jmeter where you can set number of users and its ramp up time. 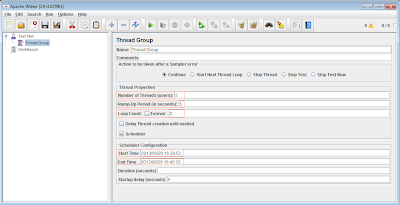 Click here to read how to add Thread group in your web test plan. Let me describe you all required properties of thread group with detail. Described the total number of threads or users used to execute test plan. Each and every user will execute full test plan. Describes time to load all users given in "Number of Threads(users)" Property. then Jmeter will load all 10 users in 100 seconds means every 1 user will be loaded after every 10 seconds (100(seconds)/10(Users) = 10 seconds). then Jmeter will load all 100 users in 10 seconds means every 10 user will be loaded after every 1 seconds (10(seconds)/100(Users) = 0.1 seconds). You can set Number of Threads VS Ramp-Up Period ratio based on your requirement. In bellow given image, I have set Number of Threads (users) = 5 and Ramp-Up Period (In Seconds) = 5 so it jmeter will load 1 user after every 1 second. Describes how many times your test plan will be executed. If you will set it 5 then full test plan will be executed 5 time. If you will select "Forever" check box then your test plan will run your test plan forever time. You have to stop its execution manually if you selected "Forever" check box. In above given figure, i have set Loop Count = 2 So jmeter will run test plan only 2 times. You can configure test start time, end time, duration and start up delay of your load test plan using Scheduler Configuration section. Click on Scheduler check box then it will show you related elements as shown in above figure. Describes when to start test. In above given figure, i have set it "2013/06/29 16:38:53". So your test will be started at "16(Hrs):38(Mins):53(Secs)" on 29th June, 2013. (Note : Your jmeter should be running on given date and time in "Start Time" field). Describes when to End test. In above given figure, i have set it "2013/06/29 16:45:70". So your test will be ended at "16(Hrs):45(Mins):70(Secs)" on 29th June, 2013. Here please note one thing - End Time is maximum allowed time to finish execution of your test plan means if your all threads has not completed its test execution on given "End Time" then jmeter will stop all pending threads execution immediately. On other end, All threads can also completes its test execution before specified "End Time". You can set duration of test to execute. For Example, If you will set Duration (seconds) = 2 then your test will be executed only for 2 seconds without considering (1.) End time and (2.) All threads has completed its test or not. Jmeter will stop test in 2 seconds. You can set delay on start up of test. If you will set it 5, then jmeter will not load any user in 1st 5 seconds when you start running your test and as soon as completion of 5 seconds, jmeter will start loading users as per given load profile settings. Under which condition the Start time and end time will show their effect ? It is not working when duration and delay fields are either kept empty or given value in them?